Happy Valentine’s Day. I can’t offer you chocolate or flowers or a love note (text?) from a Hemsworth brother. But I can offer you a swath of escapist movies to suit or soothe your mood. You’re welcome. Take two of these and tweet me in the morning. “That’s your problem,” bellows Rosie O’Donnell to Meg Ryan. “You don’t want to be in love…you want to be in love in a movie!” Yes, please. And this movie, preferably. The late, great Nora Ephron’s witty ode to soulmate searching features all the chick flick hallmarks, from an irresistible premise (Ryan’s Baltimore journalist connects with Tom Hanks’ Seattle-based widow after hearing him wax on the radio) to an unabashedly schmaltzy climax atop the Empire State Building — and on Valentine’s Day, but of course. 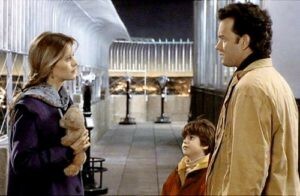 Hanks’ real-life wife Rita Wilson also pops up to deliver a hilariously weepy monologue about her favorite romantic movie, An Affair to Remember. A quarter-century (gulp) later, who wouldn’t do the same for this classic? Yeeeears before Mandy Moore made you cry on a weekly basis in This Is Us, she starred in Nicholas Sparks’ first five-hanky adapation. (And she was a teen pop star. But that’s a story for another holiday.) Recap: A high school punk (Shane West) falls for a bookish student (Moore) who has a penchant for artistry and overalls. So far, so cute, right? Then she reveals she has leukemia. Then…then…then (pause to wipe eyes with tissue). Though the cry-fest is shamelessly overwrought, the two actors nicely underplay their performances. Now when can we expect a Westaissance? Need a comic tonic? 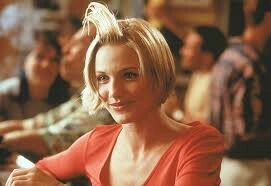 When in doubt, reach for the infamous scene in which a game Cameron Diaz uses extra-sticky hair gel on a date. Or Matt Dillon — Diaz’ real-life boyfriend at the time — doing mouth-to-mouth on a sedated terrier. Or Ben Stiller being mistaken for a serial killer hitchhiker. Or a tiny appearance from The Shape of Water Oscar nominee Richard Jenkins. Or Bret Fah-vre. In fact, this staunchly R-rated comedy — about two guys’ fight to land their ultimate dream girl — features more yuks-per-minute and yucks-per-minute than any flick in recent history. And…shhh…the Farrelly brothers even threw in a sweet happy ending to build you up (buttercup). Here’s what we really want: A sensitive someone who will point out broken glass on the ground and give instructions on how to drive a stick-shift. In short, we want Lloyd Dobler. In this beauty, the soulful kickboxer (John Cusack) puts his insecurities on the line to ask out the striking yet introverted valedictorian, Diane Court (Ione Skye). No dumb jocularity here: Cameron Crowe (Jerry Maguire) laces their timid courtship with poignant and achingly genuine moments. 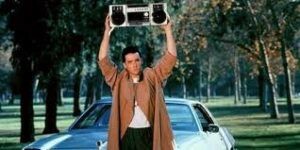 And, of course, he creates an indelible — and not at all stalker-y — image when Lloyd raises a boombox over his head and plays “In Your Eyes” to woo back his girl. Nope, can’t compete with that. Your favorite leading man has never been more irresistible than as a struggling jazz musician in this dazzling 2016 Best Picture Oscar winner. (One year after Oscar Envelope-gate, and I’m still in denial). The talented former child star of the New Mickey Mouse Club on the Disney Channel sings and dances — and, most impressively, plays piano — during his yearlong courtship with an aspiring actress (Emma Stone). This was the pair’s third outing together and their give-and-take chemistry lights up the screen. Indeed, their lovely, slightly off-key little duet “City of Stars” is a low-key highlight. 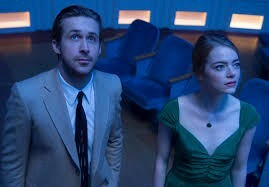 Gosling cut his teeth in deadly serious movie such as Blue Valentine and Drive. But it’s clear his true calling is channeling his inner-Tom Hanks. 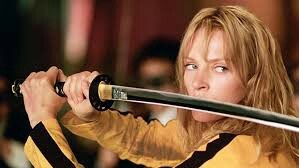 Five years ago, I would have included this Quentin Tarantino freewheeling bloody epic because the warmest love affair was between Uma Thuman’s vengeful Bride character and her Samarai sword. But in light of Thurman’s true-life horror tales of the production — in which she detailed how she almost died driving a stunt car at high speeds and noted that the writer/director spit on her for effect — the films have significant new meaning. Thurman is just one of the Hollywood #metoo survivors who have come forward with tales of abuse and assault at the hands of disgraced mogul Harvey Weinstein. So now let’s take in the films and appreciate it for Thurman’s real strength, as well as her that of her peers. Remember you know it, Valentine’s Day will be over and we’ll be into March. Otherwise known as Women’s History Month.